Join Barry at Kidabra 2005 for his live Building A Better Mouse Trap lecture. He will inspire you to stop thinking like a magician and start thinking like an entertainer! He discusses his 7 habits to enhance and simplify his magic while maintaining a high level of entertainment value. The unique tricks and routines that Barry presents are fun to watch and a pleasure to learn. 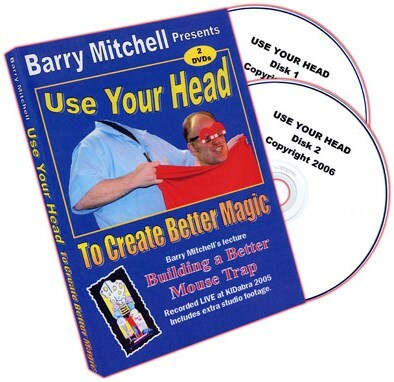 Keeping with the tradition of "The Magic of Thinking Creatively," "Use Your Head To Create Better Magic" is a must see for the beginner as well as the professional. Read the book then enjoy this DVD. The book explains each of the tricks on this DVD completely, then gives directions on how to build many of them. Double disk set with additional studio footage for material not covered at live lecture. Also includes special demo performance of Super Chicken, and Barry explains how Super Chicken started it all.